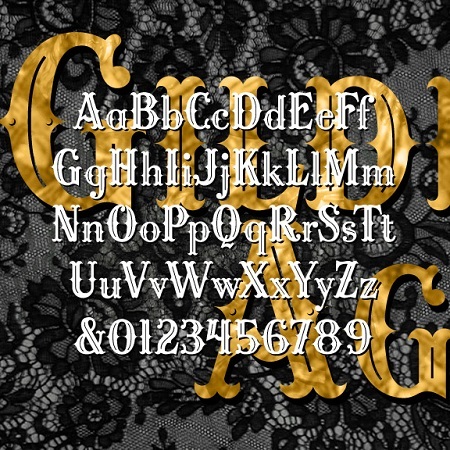 The Gilded Age is a set of ornate fonts with decorative details reminiscent of that period, the late 19th century in the US. Tricked out with “mustachio” serifs, spurs, and inlines, the Gilded Age captures the flashy ornamentation the name suggests. The set includes upper- and lowercase, with and without the engraved lines, and a large and small caps version including extra fancy large caps. Gilded Age was inspired by the titles of the film “Casque d’Or” (1952, directed by Jacques Becker). The film is set in La Belle Époque, the French equivalent of the Gilded Age.